I don’t know about you, but long about December 18th, I sometimes feel like this sweet puppy. Kind of overwhelmed by Christmas preparations. To make matters worse, it seems like the more stressed I get, the less I am able to keep costs in line. I guess desperation will do that to a person. Some years I manage to stay ahead of the game and other years, well, not as much. I find when I cross these holiday preparations off my list by , mid-to-late November, my holiday season tends to run much more smoothly, I save money and (gasp!) I am actually able to relax and enjoy the season. Isn’t enjoying the season really what it is all about? Scooping up deals. Every year, there are deals for holiday photo cards. The best ones tend to run in early November. Having your photo(s) all ready picked out, edited and saved on your computer will allow you to take full advantage of the best holiday card deals. Keep tuning in to Northern Cheapskate for photo card deals! Addresses. Early in November is a great time to scroll through your address and update anything that needs updating, like new friends or neighbors, co-workers, or even some that might need to fall off of your holiday list. You can print out the address labels now and have them ready when you need them. You should also print off return address labels for your envelopes. Stamps. make sure you have plenty of stamps on hand, so you don’t need to make a run to the post office during the busy shipping season. The holiday stamps are already available! Gift cards. If you know you are giving gift cards (I usually do modest gift cards for Sunday school teachers, coaches, bus drivers, mail delivery, etc. ), then make a list and have it handy. This is the time of year that business will run promotions. You may get a $10 bonus gift card with $50 in gift card purchases, or save 10% with $25 or more in gift card purchases. Knowing who you want to give to and in which amounts, can help you make wise purchases that can maximize your gift giving dollars. And remember – just because you need to buy $50 in gift cards, does not mean you cannot buy 5 $10 cards! Chances are, you can knock these off your list pretty early in the season. Simple gifts. If money is tight, don’t let that deter you from showing your appreciation. Whip up a batch of hot cocoa mix, put it in a bag, add a pretty ribbon and a note of appreciation. You can do similar things with bath salts, homemade treats, teacher gifts, etc. Jot down you list of recipients and plan what you are going to make, and set a date to work on it. Doing these projects in November will probably let you have enough time to include the kids (without stressing too much), and you will know you have these done well before the busiest time of the season hits. It really is the thought that counts. Stocking stuffers. I love stuffing the stockings! I usually keep a box or spot where I store all the stocking stuffers as I get them, so I can make sure I have just what I need. I have found that if I know I want something specific (I am talking to you, Lifesaver holiday book), I just bite the bullet and buy it early, instead of leaving it to the last minute and not being able to find it (’twas a sad, sad Christmas for my hubby that year – evidently, you NEED a Lifesaver “book” in your stocking). My kids feel that way about those chocolate coins wrapped in gold. Ahh, the simple traditions. Other Gifts. Be sure to write down everyone you need to purchase a gift for and leave space for ideas and notes on purchases. This will help you as you shop during the season, and save you from trying to keep it all straight in your head. Wrap it up. Whether you purchase beautiful gift wrap or make your own gift wrap with kraft paper, you can stock up on paper, tape, ribbons and other supplies now, so when you go to wrap that last minute gift you will have what you need on hand. 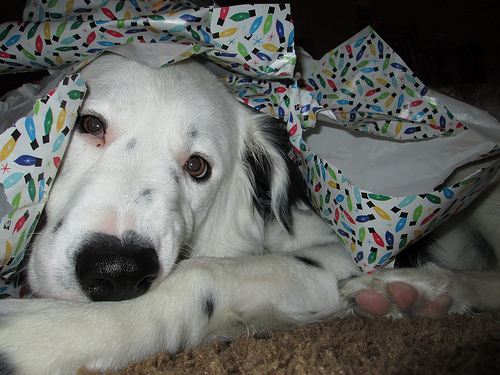 Avoid those gift wrap emergencies! Make ahead. Breads, cakes, cookies and bars can all be made ahead and frozen for 4-6 weeks without deterioration in flavor or texture. If you are hosting a meal or like to make treats, do some of the advanced work now. For both breads and cookies, you can make the dough now and freeze it for later. Your goods will be freshly baked with less effort – a great time saver when you need it. Finished goods like pies, cakes and bars can also be frozen. Be sure to let the item cool completely. Wrap it twice in plastic wrap and label it with the item description and date made. Keep a list of what you have done, so you can refer to it later. Plan ahead. Plan your holiday menu(s) now. Make the shopping list of what you need for each meal. You can stock up on items as they go on sale (this is a great time of year to stock up on holiday type foods like cranberries and baking supplies). You will also have a general plan, so when someone asks, “What can I bring?” you will have a great idea of what he or she could make from your list or to compliment your menu. Don’t forget to plan for things like beverages, appetizers, sides and desserts, as well as paper goods like cups, napkins, etc. Enjoy the holiday season! May it be both merry and bright. Here are four ways I stay on top of my game for the holidays. We do not celebrate Christmas. Instead we celebrate “Christmas-time” from the two weeks before Thanksgiving to New Year’s. 1. Each year I prepare basically the same foods ( for meals, parties, desserts, etc.) with a few exceptions. Since this is the “only” time in the year that I make these they are considered “special” by the family. I have a corresponding grocery list and start looking for foods on sale (and hopefully with a coupon) in mid-September. 2. I incorporate extra money in my Christmas budget for clearance deals in Dec. and January. Sometimes I have just a small amount; sometimes more. But it helps. 3. I sit down (after Christmas) and write myself a letter detailing the good, the bad and the ugly. (events, new foods, gifts, etc.) I have a Christmas-time spark box where it is kept. Debbie – great plan! Thanks for sharing!